WATCH the Oilers & Cougars on Friday night! Central Plains and Otis-Bison have similar roster construction. Both enjoy one well-known, electrifying player with the Oilers’ junior wide receiver/defensive back Alex Barton and Otis-Bison’s senior running back/returner Brad Lightfoot. As well, the teams have a steady player at quarterback, veteran offensive lines and multiple players who have already seen time at many positions. In addition, both squads have had several athletes return after missing all of 2015 because of injury and contribute in key roles. The makeup could yield a return to the close games of the past between the Central Prairie League foes located less than an hour away on Highway K4 near Great Bend. 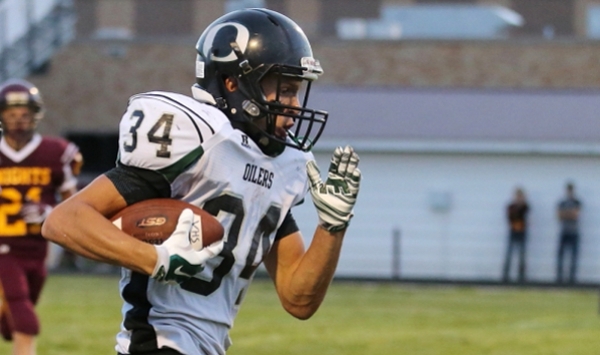 The teams have not matched up since 2013 when Central Plains shut out Otis-Bison, 40-0. In ’11-12, the Cougars won by a combined score of 90-20. Prior to 2011, Claflin and Quivira Heights had not yet consolidated to form Central Plains. From 2004-10, Claflin and Quivira Heights went a combined 7-4 versus Otis-Bison. However, no game was closer than 26 points. This marks one of the first times the Oilers and Cougars match up when both teams are considered near the top of their respective classes. Host Otis-Bison is ranked No. 2 in Eight-Man, Division II and is 10-2 in its last 12 contests. The Oilers are receiving consideration in Division I and stand at 24-2 in its last 26 games. Both teams are undefeated in 2016. Otis-Bison dealt with some injury and illness in last Friday’s 66-26 victory against Ellinwood. Lightfoot left the game in the second quarter with an ankle injury. He was cleared Wednesday. Senior lineman Bryce Maneth fought some knee problems. Senior quarterback Kade Urban had severe stomach problems, though played well in the win. All three should be healthy for Friday. Speedy junior running back Blake Bahr stepped in with seven carries for 202 yards and four scores in Week 2. Otis-Bison returned all three of its linemen with Maneth (6-foot-2, 255), junior Landon Hoopingarner (5-10, 285) and sophomore Luke Higgason (6-1, 215). Central Plains counters with senior guard Trey Schulte, a three-year starter at 6-0, 224 pounds. Schulte didn’t play in last week’s 54-8 victory over Ness City, but will play Friday. Senior James Radenburg (5-11, 248) is a returning center. Junior guard Phillip Donecker has started in the double tight-end formation, while sophomore Brett Liebl has played guard when the Oilers go to the spread formation. Starr has emphasized the fourth quarter throughout the offseason, fall camp and this week. Last season, the Cougars opened 8-0 and then lost, 68-22, to Victoria and 65-20 at Wallace County in the first round of the playoffs. In both games, Otis-Bison battled back from deficits but couldn’t stay with the opponent all game. For the Oilers, sophomore Devin Ryan stepped in at quarterback after he was the junior varsity signal caller last season. Sophomore Alex Hickel and Ryan battled for the job throughout fall camp. Hickel and Liebl missed all of 2015 with injury. Then, Hickel and senior Bryce Miller led the team in rushing in the season-opening win at Victoria. Liebl has played both defensive end positions, both linebacker spots, guard, end and receiver. The backfield doesn’t have a true lead rusher, but Hickel, Miller, junior fullback Dalton Beck, junior Anthony Oberle and junior Jacob Mcatee all have seen consistent time. Oberle, the nephew of Victoria coach Doug Oberle, scored three touchdowns in the 48-22 win versus the Knights. Overall, Steiner said the Oilers have stronger depth than last year’s 9-2 squad, an area that surprised him. Barton, whom Steiner labeled a “phenomenal athlete,” spent all summer working with Jake Sharp and playing 7-on-7. He caught three scores versus Ness City and had nine catches for 262 yards and two touchdowns against Victoria. “He is one of a kind out there,” Starr said. For Otis-Bison, the Cougars have greatly improved their passing game with Urban and sophomore Anton Foust, another multi-dimensional player who also starts at outside linebacker. Foust has four catches for 78 yards and a score. “I could move Anton around with many different roles,” Starr said. Senior Trevor Trapp had knee issues last year and didn’t play. Starr said Trapp “has been really good” and stepped in as a starting defensive back. Trapp has the team’s lone interception. Senior Tristen Dean, who didn’t play last season, has provided depth at wide receiver and defensive back. Senior lineman Cody Kaler has always had a role in his career. Starr said Kaler has worked hard in the weight room and continued to improve. Kaler has 10 tackles, Dean has eight. Kaler had 12 tackles in his career entering ’16. Junior Daniel Scott is 145 pounds but has stood out as a utility player. He has played wingback and then guard last week with Maneth out. On defense, Scott has played cornerback, linebacker when Lightfoot was out, and has moved to defensive line because of his speed and athleticism. "If you are not noticing a guard, then obviously they are doing some good things," Starr said. "I didn't have to look over there any."